[S1011] Eugenia Hobday, electronic mail to e-mail address, 20 Nov 2004. [S1011] Eugenia Hobday, electronic mail to e-mail address, 20 Nov 2004, (naming James Madison Pruett as her father). [S1012] Eugenia Hobday, electronic mail to e-mail address, 15 Nov 2004, (naming James Martin [sic] Pruett as her father). [S1011] Eugenia Hobday, electronic mail to e-mail address, 20 Nov 2004, (naming Louisa Feagin as her mother). [S1012] Eugenia Hobday, electronic mail to e-mail address, 15 Nov 2004, (naming Louisa Feagin as her mother). [S1011] Eugenia Hobday, electronic mail to e-mail address, 20 Nov 2004, (naming James Martin Turman as her father). [S1011] Eugenia Hobday, electronic mail to e-mail address, 20 Nov 2004, (naming Martha Ann Almira Pruett as her mother). [S1012] Eugenia Hobday, electronic mail to e-mail address, 15 Nov 2004. [S1012] Eugenia Hobday, electronic mail to e-mail address, 15 Nov 2004, (naming James Asburn Alston as his father). [S1012] Eugenia Hobday, electronic mail to e-mail address, 15 Nov 2004, (naming Rebecca Jane Norwood as his mother). Marriage*: He married Rebecca Jane Norwood. Marriage*: She married James Asbury Alston. • His Find A Grave memorial, which includes pictures of his tomb, is here. [S67] The Dallas Morning News, Dallas, Tex., 12 Apr 1926, part 2, p. 7 (naming B. M. Clopton as his father). [S1076] 1900 U.S. Census, Navarro County, Tex., sheet 13A, line 23 (naming Ben M. Clopton, Jr. as his father). [S1076] 1900 U.S. Census, Navarro County, Tex., sheet 13A, line 23 (stating that he was born in Oct 1886 in Texas). [S961] Find A Grave, online at http://www.findagrave.com, memorial for Samuel H. Clopton, memorial no. 39928268, viewed on 12 Apr 2014. [S961] Find A Grave, online, above, memorial for Mrs. Margaret Gibson Clopton, memorial no. 39907744, viewed on 12 Apr 2014. [S67] The Dallas Morning News, Dallas, Tex., 12 Apr 1926, part 2, p. 7 (naming B. M. Clopton as her father). [S1076] 1900 U.S. Census, Navarro County, Tex., sheet 13A, line 24 (naming Ben M. Clopton, Jr. as her father). [S1076] 1900 U.S. Census, Navarro County, Tex., sheet 13A, line 24 (stating that she was born in Jun 1892 in Texas). [S189] Navarro County Cemetery Records, vol. 9 (Corsicana, Tex. : The Navarro County Gen. Soc'y, 1989), p. 156 (giving the date but not the place). [S312] Social Security Death Index, online at http://tinyurl.com/AncestrySSDI, viewed on 11 Jun 2006 (giving the date but not the place). [S67] The Dallas Morning News, Dallas, Tex., 12 Apr 1926, part 2, p. 7 (obituary of B. M. Clopton). [S189] Navarro County Cemetery Records, vol. 9, above, p. 156. [S312] Social Security Death Index, online at http://tinyurl.com/AncestrySSDI, viewed on 11 Jun 2006 (stating that she died in Jul 1969; not naming the place of death but stating that she lived in Palestine, Tex. when she died). [S189] Navarro County Cemetery Records, vol. 9 (Corsicana, Tex. : The Navarro County Gen. Soc'y, 1989), p. 156. [S312] Social Security Death Index, online at http://tinyurl.com/AncestrySSDI, viewed on 11 Jun 2006. [S312] Social Security Death Index, online at http://tinyurl.com/AncestrySSDI, viewed on 11 Jun 2006 (stating that he died in Aug 1973; not naming the place of death but stating that he lived in Palestine, Tex. when he died). [S67] The Dallas Morning News, Dallas, Tex., 28 Mar 1971, sec. A, p. 28 (obituary of Marion A. Waters). [S1015] Sue Emerson, electronic mail to Roger Bartlett, 19 Dec 2004. [S1015] Sue Emerson, electronic mail to Roger Bartlett, 19 Dec 2004, (naming Mary Thomas Walker as her mother). [S1015] Sue Emerson, electronic mail to Roger Bartlett, 19 Dec 2004, (naming John Beall as her father). [S1015] Sue Emerson, electronic mail to Roger Bartlett, 19 Dec 2004, (naming John Beall as his father). [S1015] Sue Emerson, electronic mail to Roger Bartlett, 19 Dec 2004, (naming Mary Thomas Walker as his mother). Mayor Joshua Lucius Halbert Sr.
Mayor Josh Halbert, from Navarro County Genealogical and Historical Web Site. [S1017] Navarro County, Texas Genealogical and Historical Web Site, online at http://www.rootsweb.ancestry.com/~txnavarr/index.htm (biography of Josh Halbert) (naming Capt. Joshua Long Halbert as his father). [S67] The Dallas Morning News, Dallas, Tex., 2 Jul 1929, sec. 1, p. 3 (obituary of Josh L. Halbert) (not giving the date or place but stating that he was sixty years old when he died on 1 Jul 1929). [S1017] Navarro County, Texas Genealogical and Historical Web Site, online, above (biography of Josh Halbert) (stating that he was born in 1869 without naming the place). [S1167] Levi Jester Three Generation Family Outline, online http://www.rootsweb.com/~txnavarr/biographies/j/…, viewed on 26 Sep 2007 (stating that he was born in 1869). [S961] Find A Grave, online at http://www.findagrave.com, memorial for Joshua Lucius 'Josh' Halbert, memorial no. 27473444, viewed on 1 Aug 2013. [S1017] Navarro County, Texas Genealogical and Historical Web Site, online, above (biography of Josh Halbert). [S1167] Levi Jester Three Generation Family Outline, online, above, viewed on 26 Sep 2007. [S67] The Dallas Morning News, Dallas, Tex., 3 Jul 1929, sec. 1, p. 4 (obituary of J. L. Halbert). [S67] The Dallas Morning News, Dallas, Tex., 2 Jul 1929, sec. 1, p. 3 (obituary of Josh L. Halbert). [S1017] Navarro County, Texas Genealogical and Historical Web Site, online, above (biography of Josh Halbert) (naming the place but not giving the date). [S1167] Levi Jester Three Generation Family Outline, online, above, viewed on 26 Sep 2007 (stating that he died at home). [S67] The Dallas Morning News, Dallas, Tex., 2 Jul 1929, sec. 1, p. 3 (obituary of Josh L. Halbert) (naming Josh L. Halbert as her father). [S1017] Navarro County, Texas Genealogical and Historical Web Site, online, above (biography of Josh Halbert) (naming Mrs. Fannie Rust of San Angelo, Texas as a child of Josh Halbert). [S961] Find A Grave, online, above, memorial for Joshua Lucius Halbert, memorial no. 27458761, viewed on 10 Jul 2017 (naming Joshua Lucius Halbert as his father). [S67] The Dallas Morning News, Dallas, Tex., 2 Jul 1929, sec. 1, p. 3 (obituary of Josh L. Halbert) (naming Josh L. Halbert as his father). [S1017] Navarro County, Texas Genealogical and Historical Web Site, online at http://www.rootsweb.ancestry.com/~txnavarr/index.htm (biography of Josh Halbert) (naming Josh Halbert, III as a child of Josh Halbert). [S151] Annie Carpenter Love, History of Navarro County (Dallas, Tex. : Southwest Press, 1933), p. 259. [S1017] Navarro County, Texas Genealogical and Historical Web Site, online at http://www.rootsweb.ancestry.com/~txnavarr/index.htm (biography of Josh Halbert) (naming Mrs. Fannie Rust of San Angelo, Texas as a child of Josh Halbert). [S312] Social Security Death Index, online at http://tinyurl.com/AncestrySSDI, viewed on 25 Dec 2004. [S312] Social Security Death Index, online at http://tinyurl.com/AncestrySSDI, viewed on 25 Dec 2004 (stating that she died on 21 Apr 1997; not naming the place of death but stating that she lived in Corsicana, Texas when she died). Capt. Joshua Long Halbert and his wife, Fannie Jones Halbert, from Navarro County Genealogical and Historical Web Site. • A short biography of Capt. Halbert is here. [S961] Find A Grave, online at http://www.findagrave.com, memorial for Joshua L. Halbert, memorial no. 11394630, viewed on 1 Aug 2013. [S189] Navarro County Cemetery Records, vol. 9 (Corsicana, Tex. : The Navarro County Gen. Soc'y, 1989), p. 112. [S961] Find A Grave, online, above, memorial for Frances 'Fannie' Jones Halbert, memorial no. 27473371, viewed on 1 Aug 2013. [S189] Navarro County Cemetery Records, vol. 9, above, p. 112 (erroneously giving the year as 1974). [S189] Navarro County Cemetery Records, vol. 9, above, p. 112 (naming J. L. Halbert as his father). [S1017] Navarro County, Texas Genealogical and Historical Web Site, online, above (biography of Josh Halbert) (naming Capt. Joshua Long Halbert as his father). [S189] Navarro County Cemetery Records, vol. 9, above, p. 112 (naming J. L. Halbert as her father). 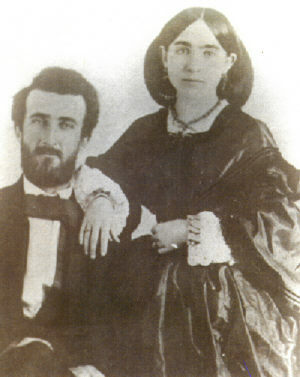 Fannie Jones Halbert and her husband, Capt. Joshua Long Halbert, from Navarro County Genealogical and Historical Web Site. Other Names*: Frances Jones, Fannie Jones, Frances Jones Halbert, Frances Halbert, Fannie Jones Halbert, Fannie Halbert. [S961] Find A Grave, online at http://www.findagrave.com, memorial for Frances 'Fannie' Jones Halbert, memorial no. 27473371, viewed on 1 Aug 2013. [S189] Navarro County Cemetery Records, vol. 9 (Corsicana, Tex. : The Navarro County Gen. Soc'y, 1989), p. 112 (giving the year but not the place or other date information). [S961] Find A Grave, online, above, memorial for Joshua L. Halbert, memorial no. 11394630, viewed on 1 Aug 2013. [S189] Navarro County Cemetery Records, vol. 9, above, p. 112. [S189] Navarro County Cemetery Records, vol. 9, above, p. 112 (naming F. J. Halbert as his mother). [S189] Navarro County Cemetery Records, vol. 9, above, p. 112 (naming F. J. Halbert as her mother). 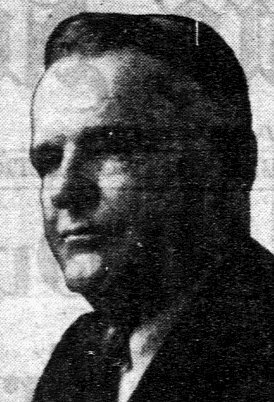 Charles W. Smith, from a newspaper obituary. Other Names*: C. W. Smith, Charles Smith. [S67] The Dallas Morning News, Dallas, Tex., 23 Oct 1936, sec. 2, p. 12 (obituary of Mrs. Alice Amanda Smith) (naming Mrs. Alice Amanda Smith as his mother). [S67] The Dallas Morning News, Dallas, Tex., 15 Mar 1947, p. 2 (obituary of Charles Winston Smith) (naming Amanda Bachman as his mother). [S67] The Dallas Morning News, Dallas, Tex., 15 Mar 1947, p. 2 (obituary of Charles Winston Smith) (naming James H. Smith as his father). [S67] The Dallas Morning News, Dallas, Tex., 15 Mar 1947, p. 2 (obituary of Charles Winston Smith) (stating that he was born in a two-room house, demolished eight weeks before his death, located about half a mile west of present-day Crown Hill Mausoleum in northwest Dallas). [S67] The Dallas Morning News, Dallas, Tex., 23 Oct 1936, sec. 2, p. 12 (obituary of Mrs. Alice Amanda Smith). [S67] The Dallas Morning News, Dallas, Tex., 15 Mar 1947, p. 2 (obituary of Charles Winston Smith). Other Names*: Ada Smith Brown, Ada Brown. [S67] The Dallas Morning News, Dallas, Tex., 23 Oct 1936, sec. 2, p. 12 (obituary of Mrs. Alice Amanda Smith) (naming Mrs. Alice Amanda Smith as her mother). [S67] The Dallas Morning News, Dallas, Tex., 29 Jan 1951, p. 10 (obituary of Mrs. Boyd Brown) (naming Amanda Bachman as her mother). [S1178] Standard certificate of death (Texas Department of Health, Bureau of Vital Statistics), no. 01237 for Ada Smith Brown, per abstract viewed online at pilot.familysearch.org on 3 Jul 2008 (naming Alice Amanda Bachman as her mother). [S67] The Dallas Morning News, Dallas, Tex., 29 Jan 1951, p. 10 (obituary of Mrs. Boyd Brown) (naming Jim Smith as her father). [S1178] Standard certificate of death (Texas Department of Health, Bureau of Vital Statistics), no. 01237 for Ada Smith Brown, per abstract viewed online at pilot.familysearch.org on 3 Jul 2008 (naming James Hickman Smith as her father). [S67] The Dallas Morning News, Dallas, Tex., 29 Jan 1951, p. 10 (obituary of Mrs. Boyd Brown) (not giving the date but stating that she was born where Crown Hill Memorial Park is now located, near Bachman Reservoir in Dallas, Texas). [S1178] Standard certificate of death (Texas Department of Health, Bureau of Vital Statistics), no. 01237 for Ada Smith Brown, per abstract viewed online at pilot.familysearch.org on 3 Jul 2008 (stating that she was born on 26 Feb 1878 in Texas). [S67] The Dallas Morning News, Dallas, Tex., 29 Jan 1951, p. 10 (obituary of Mrs. Boyd Brown) (stating that she died unexpectedly, having been stricken while visiting her sister, Mrs. L. C. Snowden, in Dallas). [S1178] Standard certificate of death (Texas Department of Health, Bureau of Vital Statistics), no. 01237 for Ada Smith Brown, per abstract viewed online at pilot.familysearch.org on 3 Jul 2008. [S67] The Dallas Morning News, Dallas, Tex., 29 Jan 1951, p. 10 (obituary of Mrs. Boyd Brown). [S67] The Dallas Morning News, Dallas, Tex., 6 Aug 1939, sec. IV, p. 7 (funeral notice for Boyd Brown) (not giving the date or place but stating that he was sixty-three years old when he died on 5 Aug 1939). [S1178] Standard certificate of death (Texas Department of Health, Bureau of Vital Statistics), no. 36867 for Boyd Brown, dated 7 Aug 1939, Mrs. Boyd Brown, informant, per copy viewed online at pilot.familysearch.org on 3 Jul 2008. [S67] The Dallas Morning News, Dallas, Tex., 6 Aug 1939, sec. IV, p. 7 (funeral notice for Boyd Brown). [S1178] Standard certificate of death (Texas Department of Health, Bureau of Vital Statistics), no. 36867 for Boyd Brown, dated 7 Aug 1939, Mrs. Boyd Brown, informant, per copy viewed online at pilot.familysearch.org on 3 Jul 2008 (naming the cemetery but not giving the date).